Yesterday morning I took a few more images of this daylily, which had begun blooming last week. It was purchased from Roger Mercer at Mercers’ Garden in Fayetteville, NC, during an excursion to his daylily farm with my sister and daughter around 2005. We walked around his sandy fields (so different from the clay soils of Chapel Hill) and selected our plants, then waited as a helper dug then out of the ground and carried them to the car for us. 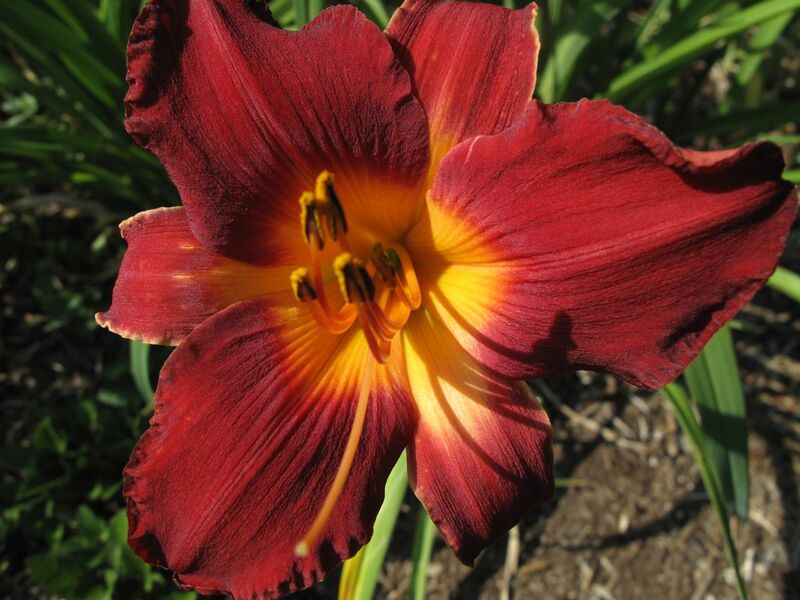 Knowing very little about daylilies at the time (or now), color was my main criterion. I simply wanted a red one and out of hundreds of plants, very few were red. It is a mystery why I failed to ask or record the daylily’s name when the breeder was right there. 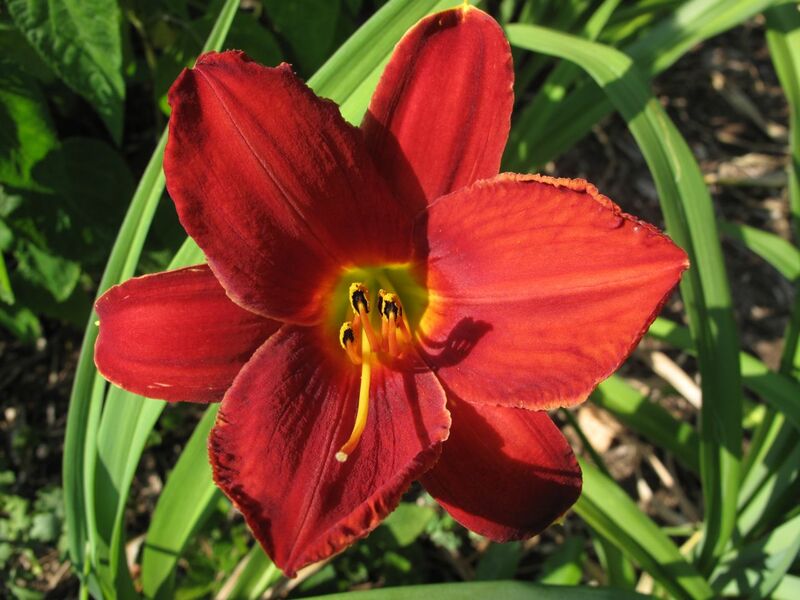 Using the Mercers’ Garden website, I did some research to try to identify this daylily and have concluded it is ‘Michael Arnholt,’ Chief Red Cloud x Seedling. One of Roger Mercer’s introductions, this dates back to mid-1980s. Mercer describes the special properties of this midseason-blooming daylily as “heavy, waxy substance and ribbed texture” and under flaws he says, “Doesn’t fully open until about 9:30 a.m.” When I read this I pictured a sleepy teenager, struggling to wake up. Mercer worked many years for The Fayetteville Observer and wrote a garden column for the paper; this daylily was named for then managing editor Michael Arnholt (who retired as executive editor in 2012). Plants are drying up with lack of rain and extreme heat. Wednesday, 99°F. Thursday, 97°F (downgraded from 100°F). Friday, 95°F. Saturday, 95°F. Sunday, 97°F. This entry was posted in garden and tagged garden photography, Hemerocallis 'Michael Arnholt' (Daylily), nature photography on June 18, 2014 by pbmgarden. 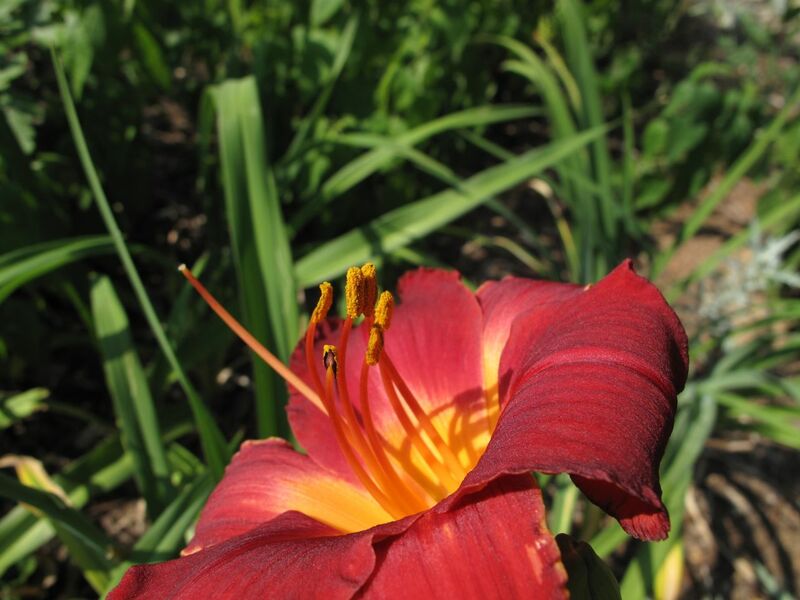 Your Hemerocallis is a wonderful colour, Susie, and I enjoyed reading the story behind it. Thanks Christina. I know I’ve mentioned snippets about the daylily before, but couldn’t find the name of it last week and decided to collect my notes about it in one place. Lovely Day Lily and I enjoyed the notes too, especially the part where she does not bloom till 9.30a.m and your comment on teenagers. Wow, your temperatures are hot! Thanks Julie. Glad you enjoyed it. It has already been a hot summer and summer hasn’t officially arrived–and so dry it makes it discouraging to see the garden struggling. I really sympathise, thats tough to see nurtured or any plants struggling. I’ve just looked average temperatures up in North Carolina, I had not appreciated it can be that hot where you are. A lovely colour, it doesn’t t matter what it’ s name is, it’ s beautiful. Thanks Chloris. Don’t know why I feel compelled to give it a name, but I feel better now! I like your daylily very much, lovely colour. I have two that are similar, one tall and one medium height, they are covered with buds at the moment, but haven’t started to flower yet, usually July when they flower here. 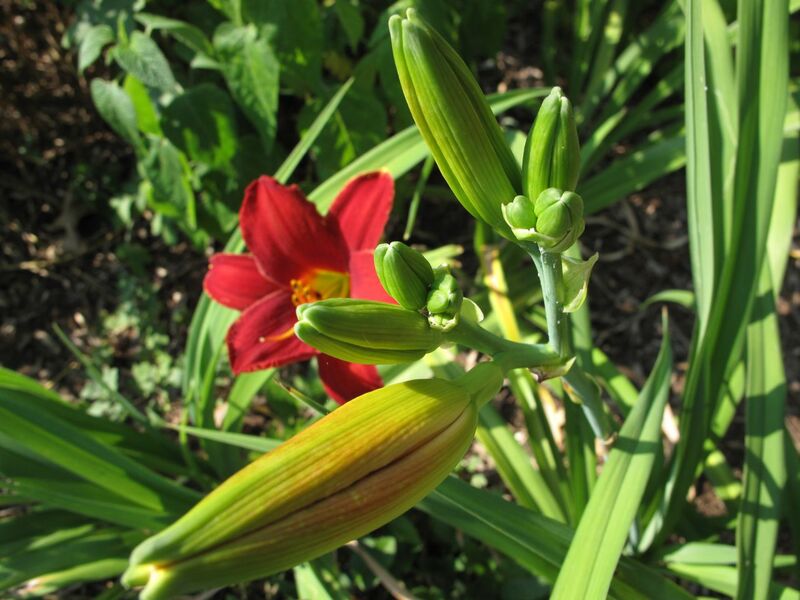 Pauline, I look forward to seeing your daylilies once they open. This one opened early by a week compared to last year. Ooh, that’s hot! It’s cooler here but my plants are also starting to shrivel due to severe lack of rain. 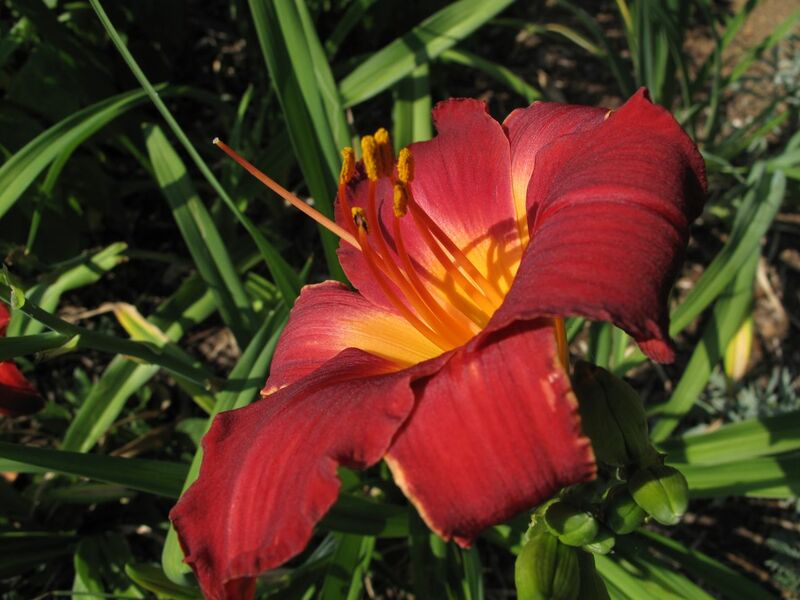 The day lilies can always be relied on though, and that colour is really lovely! Sorry to hear you’re lacking in rain also. I would have more daylilies but hate to tempt the deer. So far they’ve left this one alone this year. Glad you like the daylily. Seems not so long ago we were lamenting the cold Judy. Yikes that’s an ominous forecast, and dry too… that’s my idea of the worst summer weather. It must be refreshing to see all the perky daylilies opening in the morning as the other flowers wilt in the heat. I would grow more, but I don’t like the midseason yellowing of the leaves. Yes, the forecast is ominous and so far has been accurate, if anything hotter than expected. The daylilies’s foliage is already turning yellow–unless we get rain soon the garden will have to die back until fall. Bummer. Very gorgeous and I to love the color. Thanks Charlie. That red daylily is a sight for sore eyes in my garden right now. I totally can relate to not knowing what’s in your garden. I spent a lot of time tracking down all my daylilies names last summer. There’s great websites, and luckily you knew where you got it. I love the red! Good luck with the weather. We’ve been hot too, high 80’s and 90’s. Most of the storms have missed us lately but today we got about an inch of rain. That’s enough for now I hope. It is nice to have all these web resources to help us sort out our plants. So glad you got some rain. I like red daylilies too. My favorite is ‘Chicago Apache’. I looked up Chicago Apache and can see why you like it. Very nice.